With the holiday season arriving, a large number of people will be travelling to see friends and family.Many will be staying in hotels overnight or for extended weekends, but very few will be thinking of the tiny critters that may be lurking in that hotel room – Bed Bugs! Those are the two words that have the ability give people nightmares and the hebbie-jeebies. Bed bugs can instantly ruin a good holiday, so the best thing for stress-free travels is learning how to check your hotel room for bed bugs. This will help you from bringing the unwanted and unwelcomed guests home with you! One very important thing to remember is that bed bugs do not discriminate – they can be found in luxury hotels as easily as budget hotels. The misconception that bed bugs only inhabit dirty, cheap hotels or hostels is one of the reasons bed bugs are easily transported – people feel safe in their sparkling clean hotel room and let their guard down, not realizing that it can harbor the insects. 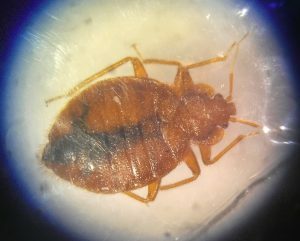 Bed bugs, Cimex lectularius, have small flat bodies, about the width of a credit card. They can fit in tiny spaces making it easy for them to hitchhike from place to place via furniture, clothing, or luggage. Safeguard your luggage first: put your luggage and accessories in the bathtub or shower as soon as you walk into the room. Bed bugs cannot climb slick surfaces, so the bathtub is the safest place to keep your belongings while you check the room. Identifying bed bugs: bed bugs are quite small and easily missed. Adults are 4 to 5mm and usually dark or rust color. They are comparable in size to an apple seed. Nymphs are half the size of adults and have clear bodies until they feed. Check the sheets: Pull back the comforter or bedspread and look for tiny rust colored stains on the bedspread and on the sheets. Bed Bugs are tiny vampires. They feed on human blood. The dark spots are the waste products from the bed bugs feeding on blood. Be sure to check the pillows as well. Check the mattress and boxspring: Look for the same tiny black or brown stains on the mattress and box spring. Check the mattress and box spring for stains around the entire mattress: in the beading, under the mattress handle, around the button, and on both sides of the mattress (if possible). There will be a larger stain if a bed bug has been squished while on the mattress. Check the headboard and other areas around the head of the bed: Bed bugs like to hide where it’s dark. They will hide in or behind the headboard, the nightstand, picture frames, and electrical outlet covers. You may or may not see the actual bug, but if you see the signature rust colored spots then you know they are hiding in the room somewhere. Check other furniture in the room: if there are other pieces of furniture in the room such as chairs, couch or loveseat, make sure to take the same care in checking those areas for bed bugs as well. Don’t forget to check the luggage rack! This should set your mind at ease knowing your hotel room is bed bug free and you can sleep in peace. When you return home and have concerns you may have brought home a stray bed bug, place your clothing in the dryer on the highest heat possible for up to 30 minutes. Bed bugs can survive a clothes washing cycle, but they are no match for a hot dryer (temperatures about 113°F). Additional information on bed bugs, their life cycle, and management can be found in the following EDIS publications: Florida Insect Management Guide for Bed Bugs (http://edis.ifas.ufl.edu/IG083) or Bed Bug, Cimex lectularius Linneaus (Insecta: Hemiptera: Cimicidae)1 (https://edis.ifas.ufl.edu/in297). EDIS is the Electronic Data Information Source of UF/IFAS Extension and contains a collection of information on relevant topics. Wishing you safe and bug free travels this holiday season. Carol is the Chemicals in the Environment agent at UF/IFAS Extension Sarasota County.